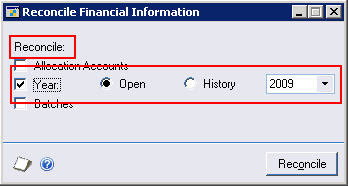 GPtip42day - How do I reconcile a cash account with no transactions for the period? GP provides a way to 'Reconcile' summary and detail data within the application. Each module has its own Reconcile utility. For instance, Tools>Utilities>Financial>Reconcile opens the Reconcile Financial Information window. Mariano Gomez had a great piece of advice on the Newsgroup regarding ACH batches and Bank Rec so I decided to formalize it and turn this into a Weekly Dynamic. Dynamics GP 10 introduced new, Excel based, functionality to reconcile AP to the GL (Dynamics GP-Tools-Routines-Financial-Reconcile to GL). Unfortunately, this doesn't seem to work correctly if there are outstanding transactions paid by credit card. How to setup all modules to be 100% reconciled to GL? GPTip42day - In which order should I run the Reconcile Utilities in GP? This situation presents us with a unique set of circumstances as you can not restrict the Receivables aged trial balance by account. It can be restricted by payment priority and class so with some forethought and planning you could have debtor classes set up that use a specific control account or something similar along the lines of payment priority. If you have not done this or you think some transactions may have been miss posted then using smartlists would be your next best thing. In Smartlists you can create a report for the receivables transactions based on the system date range and then create a report for GL (account transactions) for the system date range. This way, you can compare when the information was physically entered in the system (even with a different document date between modules). If one of the modules has the transaction posted and the other is missing, you can determine if the transactions were posted with a different date in GL than in receivables. Amy Walsh has coverage of the Reconcile to GL features in Dynamics GP over at DynamicsCare.